Fresh off their state visit to Mexico last week, King Felipe and Queen Letizia of Spain welcomed the Peruvian president and first lady to Madrid on Tuesday. For the official welcome ceremony, Queen Letizia gleamed in a white dress. She accessorized with her freshwater pearl drop earrings by Tous. At the state banquet on Tuesday evening, Letizia looked like she'd arrived straight out of a fairytale in a gorgeous purple gown. 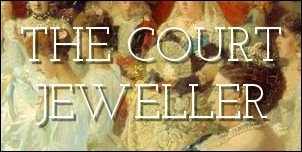 Her jewels were somewhat predictable: her mother-in-law's diamond floral tiara, plus her own diamond wedding earrings. She also secured the sash of her order, the Order of the Sun, with the same small diamond brooch that she wore in April at Queen Margrethe of Denmark's birthday celebrations. Peru's first lady, Nadine Heredia, also looked lovely at the banquet. She's wearing a Spanish order here: the Order of Isabella the Catholic. What do you think of Letizia's state visit jewels? Which new tiaras are you hoping to see make an appearance on the queen soon?